And the American people are more than willing to be held in this state because to know the truth — as opposed to only believe the truth — is to face an awful terror and to be no longer able to evade responsibility. It is precisely in moving from belief to knowledge that the citizen moves from irresponsibility to responsibility, from helplessness and hopelessness to action, with the ultimate aim of being empowered and confident in one’s rational powers. Today most Americans believe there was a conspiracy to kill President Kennedy, but they don’t know it. They don’t want to know it — and our government doesn’t want to know it and our elected representatives don’t want to know it, because knowing it would mean having to do something about it. That is an awesome thought. History Will Not Absolve Us is written for a boundless non-market of individuals who are not afraid, but anxiously seek, to have their thinking taken off its comfortable tracks, so as to be tested on more challenging and perhaps better embedded and truer lines. Each strand of this book’s analysis is woven into a developing pattern by an excellent web of reasoning that stretched my thinking to an incredible degree and stirred me to re-examine issues I thought were comfortably settled. February 2019: 1996 hardcover copies of History Will Not Absolve Us are availble for $10 (includes shipping & handling) to domestic destinations. In our efforts to confront the truth of the assassination of President Kennedy we are at a very different point today than we were thirty years ago when the first critical analyses of the Warren Report were published. Dozens of books and thousands of magazine articles have been written about this case. Almost without exception, no matter what the author’s view concerning who killed President Kennedy or why, these works have directly or indirectly contributed to the public’s conviction that the murder of the President is a mystery. As a result, although a vast majority of our public believes that there was a conspiracy, most people do not know this as a fact and are convinced that they can never know for sure what happened. On both points the public is mistaken. The murder of the President is not a mystery. The nature of the conspiracy that took President Kennedy’s life was from the outset quite obvious to anyone who knew how to look and was willing to do so. The same holds true today. Any citizen who is willing to look can see clearly who killed President Kennedy and why. The fact that “no one knows this” is an example of a subtle process of Orwellian mind control which has enveloped our society and which our public has been more than willing to have foisted upon it. The process has been orchestrated by the CIA in defense of itself and the “powers that be,” but it has also been critically aided by the entire spectrum of our society’s intellectual and political establishments, right, center, and left. The assertion that I and other ordinary citizens know, know for a fact, that there was a conspiracy and that it was organized at the highest levels of the CIA — such an assertion is likely to strike most citizens as the ravings of a fanatic, a person whose mind is closed to civilized discourse. The ordinary citizen, on reading a simple, honest, and critical analysis of the facts (see Appendix III) will typically experience an automatic psychological reaction of recoil because of the vast national process of cover-up which an honest analysis of the facts implies. “Something is wrong here. It can’t be this obvious,” is the natural response. It is a measure of the Orwellian mind set that pervades America today that to assert what is obvious and known (as in the tale The Emperor’s New Clothes) triggers such a psychological reaction. In reality it is the ordinary citizen’s mind which has been closed to the vast process of denial and cover-up which has pervaded our society. Thus, my starting point is to awaken the reader to how, in an “open society” like our own, the CIA could murder the President and see to it that the crime is “covered up.” Once this befuddling matter is laid bare, the reader will be freed to go back and assimilate in an unobstructed manner what has long been quite obvious and known about who killed President Kennedy and why. As I edited the April 5th letter for publication, it seemed logical to break the letter into two parts. The reason behind the division is the transition that occurs in the course of the letter, a transition in the underlying political ideological assumptions of the analysis. Part I is an analysis of the assassination for the light it throws on the Orwellian nature of our society. This section of the letter requires of the reader no particular ideological orientation other than a commitment to truth and logic, and a willingness to confront the dictates of logical analysis of facts wherever it leads. In other words, it requires a person whose mind is not bounded by the terms of American “Crimestop.” The first section deals with how our public, government, and media approached the available facts on the assassination and what this implies about the nature of our democracy. Part II is directed toward exploring a broader issue of history, how we as a people came to be in such a state of affairs. Here a certain political ideological orientation is required of the reader, or at least a willingness to be open to a certain political ideological orientation. In my view the way in which our society reacted to the murder of its President by the CIA is part of a seamless web of historical development which has now been occurring for more than a century, ever since the destruction of the “Reconstruction” movement following the American Civil War. An awareness of this overall historical context is important if we are to appreciate the true dimensions of the political problems we face as a people. The thirteen appendices which follow the April 5th letter provide a variety of documentary evidence as well as additional analyses. 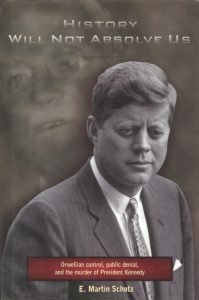 The reader will find amongst these appendices important analyses of both the “external” record as well as the “internal” record on four significant points: the development of President Kennedy’s thinking and activity with regard to the Cold War, the immediate reaction of the government of the United States to the assassination of its President, the work of the Warren Commission, and the role of The Nation magazine and the left/liberal establishment in the cover-up of the assassination. The appendices begin with the text of President Kennedy’s June, 1963 speech at American University. This speech provides the context of the assassination and helps to clarify Castro’s view of Kennedy, which appears in Appendix II. Appendix II, a speech by Fidel Castro, constitutes a highly sophisticated analysis of the external record of the immediate reaction of the United States government and its media sources. This can be correlated with Appendix IV, where one will find an analysis of important internal data on this question. Three articles by Vincent Salandria appear in Appendix III. These articles, taken together, show the progress of his analysis of the work of the Warren Commission. He at first used only the Warren Report as a basis (the external record), and subsequently used an “internal record” of the Commission’s work, the twenty-six volumes of Commission exhibits which were released in early 1965. Appendix V provides data which identifies Lee Harvey Oswald as the CIA agent he was. Appendix VI presents a novel form of analysis which casts light on how the assassination of the President was covered up. In Appendix VII the reader will find both an analysis of the “external record” of The Nation’s activity as well as a detailed memoir which represents an “internal record” of The Nation’s attitude toward the assassination. Finally, by correlating President Kennedy’s June, 1963 speech at American University (Appendix I) with Nikita Khrushchev’s January 31, 1963 letter to Fidel Castro (Appendix X), the McCloy-Zorin Agreement (Appendix IX), and Castro’s speech (Appendix II), one is able to correlate external as well as internal data on the significance of President Kennedy’s activity with regard to the Cold War as the motivating factor for his assassination. Appendix VIII, “The Work of Ray Marcus,” provides additional external as well as internal data on many questions concerning the nature of our society and its response to the assassination. Appendices XI and XII provide psycho-social and philosophical analyses of the society’s response to the assassination. Appendix XIII is a speech by Fidel Castro to a recent United Nations-sponsored meeting. It provides a context for the continuing significance of the President’s assassination. As citizens who have turned away for thirty years from the truth of the murder of our elected head of state, we should not be surprised that today we find our nation in intellectual, political, and moral chaos. Confronting the truth of President Kennedy’s assassination and its coverup is but one small step on a long path out of that chaos and toward healing, a path along which we must confront the true nature of our democracy and the reality of what our nation has become for its own citizens and for people throughout the world. Such a process of healing is not pleasant. It is a difficult and painful path, but it is a necessary one. History will not absolve us.